In what may be the most curious case of video game character creation around, the Mortal Kombat fighting game universe includes a character created by debug code. How does debug code create what ends up as a playable character and part of the game’s lore? That is a story that unfolds in a manner nothing quite like the way you might imagine. The original arcade version of Mortal Kombat had an entry, buried deep in the diagnostic and auditing menus, for “ERMACS.” Some distributions of the game even had the entry listed with other entries that referenced characters. This started a rumor that there was an undocumented character in Mortal Kombat named “Ermacs.” In reality, the “ERMACS” listing was actually a legitimate diagnostic entry for “ERror MACroS.” The error macro tool was simply a vestigial bit of code left behind from the debugging phase of game development and had no relation at all to playable character content. 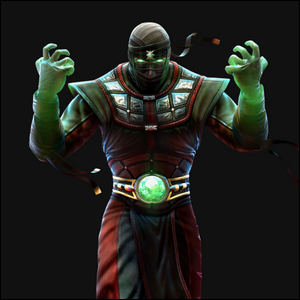 With the release of Ultimate Mortal Kombat 3, however, poor old Ermac finally got his day in the sun when the development team dropped him into the game as a playable character. He has since appeared in nine additional Mortal Kombat incarnations. Shocked by that number? There are over twenty total Mortal Kombat games including sequels, spin-offs, and remakes. Image courtesy of Midway Games.